It's Monday! What are you Reading? is a kidlit meme hosted by Jen and Kellee at TEACH.MENTOR.TEXTS. They tell about books and book and more books. My list grows longer every week from them and those that link up. 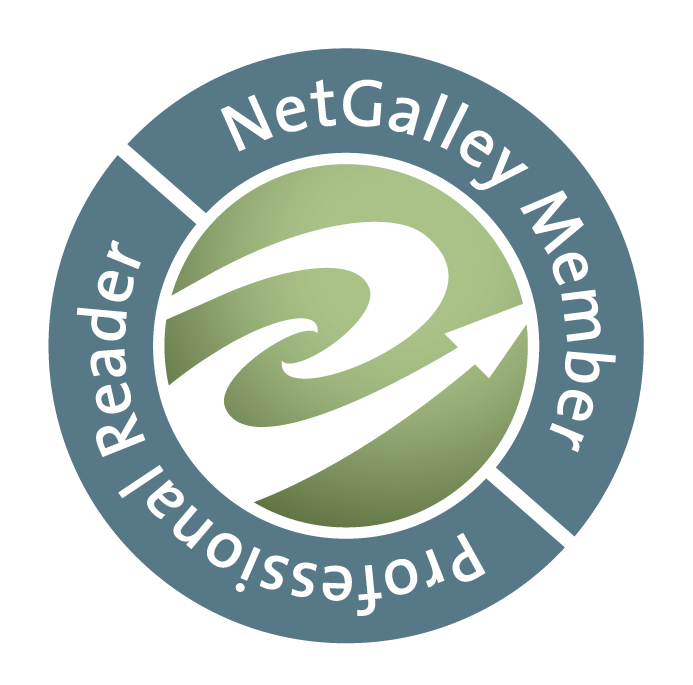 There is another meme hosted by Sheila at BOOK JOURNEYS that offers even more reviews of all kinds of books, adult and children. Enjoy the visit! Use the hashtag #IMWAYR to share on twitter! 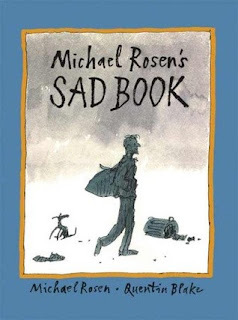 I have also taken the Gathering Books Award challenge this year, and have read my first book that has won several awards, Michael Rosen’s Sad Book, by Michael Rosen and illustrated by Quentin Blake. Michael doesn’t hold back, but shared how the sadness affects him because his son dies. He uses the story to tell about his personal sadness and how that looks. For example, sometimes he wants to talk with someone about his sadness and sometimes he wants to be alone. This is a book that shows the rightness of being sad, and also, that sometimes things are better. It’s a perfect book to share with students or adults who are grieving. It touched me with every page, along with the stark black & white drawings that show darkness when needed, but colors too in a light style of pen and ink outlining plus watercolor. Standing up for what is right is a difficult thing. This book shows what can happen if one cannot find the strength and courage to speak up when one knows something is happening that is wrong. It can be used for all ages to begin discussions about the historical time of the Holocaust, but is written for young children as an introduction to those times. It tells the story of animals in the forest and each time Terrible Things come for a certain group, like those with feathers, everyone else is relieved that they are not taken. They step away, not understanding, yet still happy to be left alone. There are key phrases that adults will notice, like “we mustn’t ask” and “It doesn’t matter” and “Life went on almost like before.” Stephen Gammel illustrates the text in black and white, showing well the fear of those taken and the creepy faces of the Terrible Things. It is a chilling book, perhaps because I already know what happened, and I hope others remember to tell the story and talk about it, again and again. There are numerous lessons available for this book! 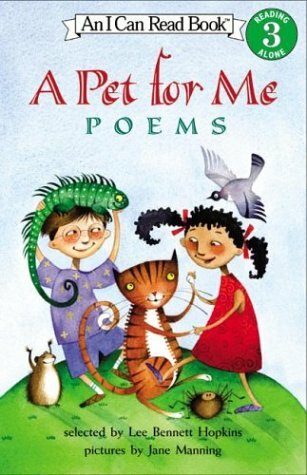 I am planning some Poetry Friday lessons for a primary class and a colleague loaned some of her collection of “I Can Read” books of poetry. 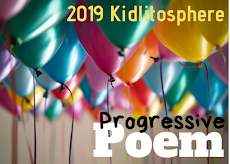 All but one are poems selected by Lee Bennett Hopkins, that include a wealth of wonderful poems to enjoy by poets such as Valerie Worth, Karla Kuskin, Jack Prelutsky, Charlotte Zolotow, Aileen Fisher, Carl Sandburg, and J. Patrick Lewis. 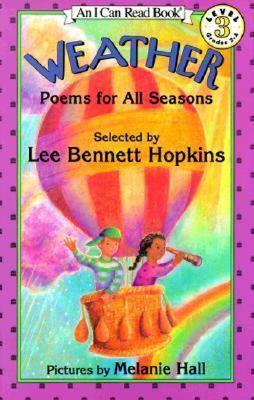 There are poems about cooking, weather, pets, animals, space, and silliness, all the topics that delight young children. Varied illustrators, often showing a bit of whimsy as well as being realistic, illustrate the books. If you don’t know about these, try to find them. There are many books of poetry available and useful, but these will add some gems to your collection. I am often amazed at the stories Mo Willems creates. They don’t always seem as if they would be good, like this one. It’s about a little girl who has a pet alligator, that I think is stuffed because as we find out toward the end of the book, she bought it in the sale bucket. Now that sounds just a bit silly to me, but it is darling, about friendship & making each other laugh as well as making each other feel better. I can easily imagine younger children giggling at this one. 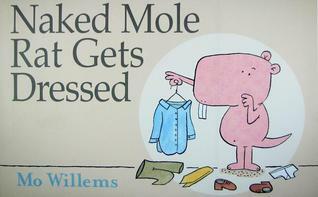 ALSO- I read Naked Mole Rat Gets Dressed at my granddaughter’s a few days ago, also by Mo Willems. This is definitely a huge giggle book. Didn’t you give a little giggle when you read the title? But it’s more, it’s a great text for discussions about doing things differently from everyone else, and being okay with that. Or, accepting someone who does things differently, and that’s okay too. Terrific! 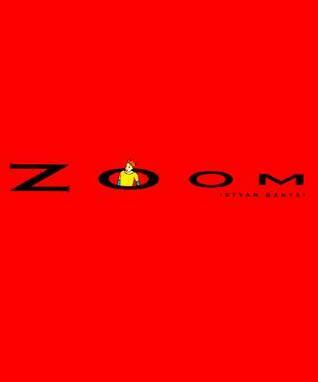 Zoom – Istvan Banyai - A marvelous wordless picture book that reminds me of Looking Down, by Steve Jenkins, which I reviewed here. This time, however, the zoom works differently, and begins with a fancy design, which turns into a rooster, which turns into a farm scene. It’s fantastic imagination and I can imagine having older students doing an art project with this book as a mentor text. It came out in 1995, so it’s been around, but a friend just loaned it to me. Another Sarah Stewart and David Small book was also loaned to me, this time The Quiet Place, also a story told in letters, like an earlier one, The Gardener. Their collaboration brings us beautiful books, and this is the most recent. 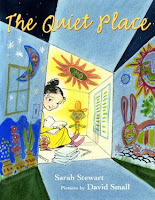 It concerns Isabel, a young girl recently moved to the U.S. from Mexico, who writes her Aunt, missing her dear aunt and her former home, & language, very much. Through the use of discarded big boxes, Isabel creates her quiet places, and as time goes on, they become quite elaborate, but also Isabel becomes more at ease in her new home, as she makes friends. It’s a sweet book, with beautifully detailed illustrations. Hello! Hello! – Matthew Cordell – This is a to-the-point story that gives straight advice in a fun story about a girl who is trying to get someone’s attention. Most of the family are ‘plugged in’ in some way, and She finally does, in an imaginative way, as she goes outside to say hello to nature. The illustrations are realistic and whimsical, rather cartoon-like. You’ll see. . Surprises happen. Started today: A brand new book downloaded on my IPad from a Colorado author, Stephanie J. Blake is The Marble Queen. I’ve read three chapters and already enjoy it, with its great voice in the main character and her family. Happy Reading Back To School Everyone! Some terrific books here, Linda, and many I didn't know! Happy Reading! Thanks Katherine. Hope you find a few more to read! The Sad Book sounds amazing - and I'd love to know what you make of Penny Kittle's book! I'm still plugging along with Book Love Tara. There's just so much to do besides reading 'my' books. Maybe things will settle down a bit in a couple of weeks. The Sad Book is amazing, but I liked it very much. Thanks! What a fun list, Linda! I read Hello, Hello as well. I liked it, and I liked all the creative things that happened. I liked the use of color vs. grey drawings too. It is a fun book, I agree, Maria. Picture books can do so much! Such a wonderful reading week. 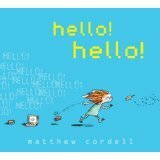 I also read Hello, Hello...such a great reminder. I put Michael Rosen's book on my TBR list just now. I love Quentin Blake's illustrations. 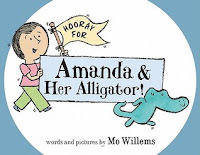 And Mo Willems is a gift to picture books, so talented! Until now, I was not familiar with Quentin Blake. The illustrations are amazing. I'll look for more. Thanks, Gigi. Hi there dearest Linda. I love Istvan Banyai's wordless books, aren't they absolutely brilliant? I discovered him when we were doing our wordless books theme. There is a sequel to Zoom called Rezoom which I think Iphigene has reviewed. I read and reviewed his "The Other Side" - also a play in perspective and as brilliant as the others. 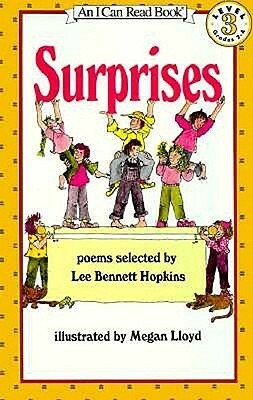 Isn't Lee Bennett Hopkins wonderful? He has a collection of poems for absolutely EVERYTHING under the sun. I haven't heard of this easy reader collection, I hope I can find them in our libraries. The one by Karla Kuskin also sounds delicious. Thank you so much for joining us yet again in our reading challenge, such a thrill! I always look forward to the books you have to share. 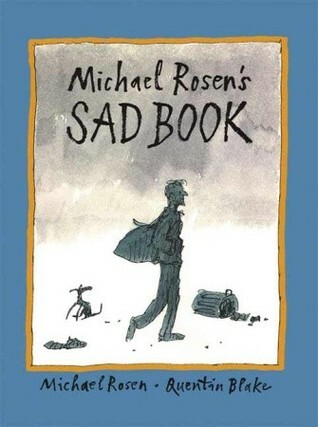 I've been staying away a little bit from Michael Rosen's Sad Book as I know it would make me cry. Your review though makes me want to really read it for myself. I always enjoy books written by David Small and Sarah Stewart - I think I must have done a review of The Gardener as well last year, will definitely find this new one soonest. :) And Mo Willems! He is a gem. So prolific. Hope you enjoy the rest of your reading week, dearest Linda! Oh my, it's so exciting to hear that there's more of the Banyai's picture books, Myra. I will certainly look for them. And It was exciting to see another Small/Stewart collaboration-just great! The Sad Book is just that, but I liked it nevertheless, & appreciate the tender thoughts that he put into it. Thank you Myra. I can't wait to read the new Stewart/Small book. I love everything they do! Mo Willems truly is amazing. These titles you highlighted are a lot of fun to read with children! Well, you know I agree, Carrie. All of these book artists are just terrific. I was excited to get the Stewart/Small book. A friend found it & brought it to me. Thanks, Carrie. This book sounds so incredibly -- sad. (I'm not trying to be funny.) It made me think of "Tears in Heaven" by Eric Clapton. Do you know that song. This book looks like a powerful title. (It's Michael Rosen. Of course it'll be powerful!) Thanks for the recommendation. It is sad, some because one knows it is true, but it also is supportive because people do have all those feelings, and many need to know that it's okay to have them, and have them mixed up too. I know that each will read the book differently, yet a friend just loaned it to me & thought it was appropriate for many, children & adults. I've had two students whose parents died when I had them & I wish I would have had the book to share & talk about with them. Thanks Stacey! Michael Rosen's Sad Book seems like it'll be an interesting read. And, I feel like I should read more Mo Willems books because I keep recommending his books to our customers. I did like the message of Hello! Hello! Willems is very funny, especially for the young ones. He has such an imagination. And the Sad Book is good, and will be helpful when needed. Thanks, Earl. This is such a powerful book. Though I have to say my nephew picked it out at the library when he was 3 or so from the picture book bin, and my SIL had to kind of make up a whole other reason/story to go with the pictures. It totally caught her unaware. A really important book to have available, though. Thanks Laura. I imagine your sister-in-law had to be quick to find a different approach with the illustrations.